Beijing: China's gross domestic product (GDP) grew 6.8 per cent year-on-year in the first half of 2018 to about 41.90 trillion yuan ($6 trillion), official data revealed on Monday.According to the National Bureau of Statistics (NBS) data, the pace was well above the government's annual growth target of around 6.5 per cent, extending a steady expansion, reports Xinhua news agency. 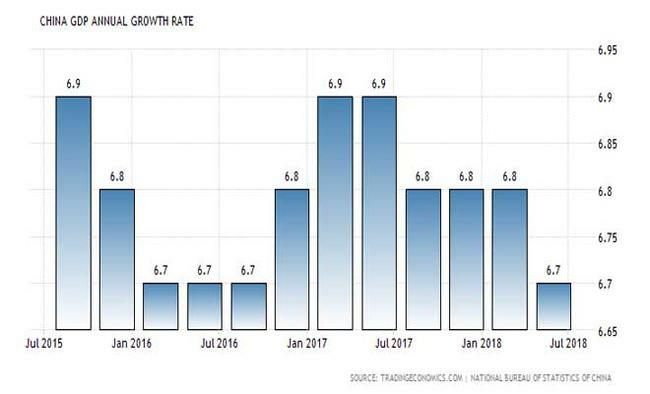 In the second quarter, China's GDP rose solidly by 6.7 per cent year-on-year, slightly lower than the 6.8 per cent in the previous quarter but representing the 12th straight quarter that the GDP growth rate has stayed within the range of 6.7 to 6.9 per cent. The service sector expanded 7.6 per cent year-on-year in the first half, outpacing a 3.2-per cent increase in primary industry and 6.1 per cent in secondary industry, according to the NBS.Consumption continued to play a bigger role in driving growth, with final consumption contributing to 78.5 per cent of the economic expansion in January-June, up from 77.8 per cent in the first quarter and 58.8 per cent last year. NBS spokesperson Mao Shengyong said the Chinese economy has been running soundly in the first six months, offering "a good start" for the country's pursuit for high-quality development with further restructuring progress and improved economic quality and efficiency. However, noting increasing external uncertainties and the fact that China is still going through a critical stage in structural adjustment, Mao said the country would stick to the supply-side structural reform and coordinate efforts to ensure stable and sound economic performance.China's economy expanded 6.9 per cent in 2017, picking up the pace for the first time in seven years.